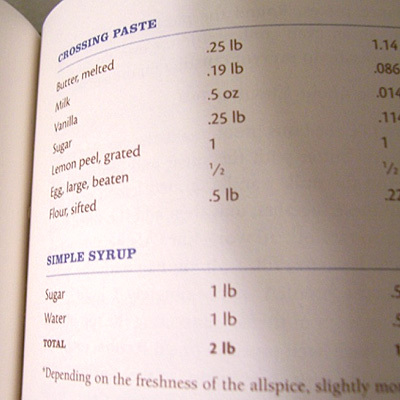 Somewhere between 5th and 8th printings, the editors of the book changed the Hot Cross Bun paste ingredient list. Either pastes should work but obviously Mr Hamelman prefers the second updated version. 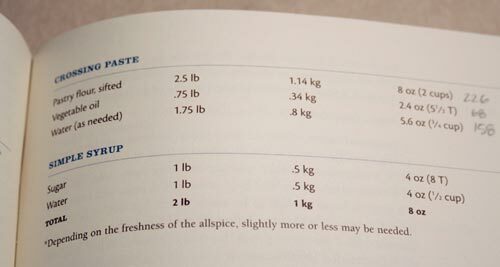 I don't have the 2nd version in my book (5th printing) so if someone does have it, can you please write out the ingredients and home measurements here? You melt the butter with the sugar, add everything but the flour + mix well, and then add the flour. That's great Andrea, my numbers run from 10 - 2 does that mean I have the second edition ? Sounds like a lot of paste though for the buns. Did you have lots left over? Zeb, NOOOOOOOOOOOOOOOOOO... of course she is not her own dad ... I meant to say that Abby got this information from her dad. Sorry, Abby!!!! Going to change that in my reply - I'm not a native speaker, so I hope you'll forgive me! A little egg for the paste plus a scrambled egg sandwich? I recently did something that required 1.5 eggs or some such so the dogs got a little scrambled egg with dinner.